Tunney's word and silkscreen artwork has a little Yves Klein, a little Duchamp, and a little Warhol. His gallery space at Wynwood Walls is more of a hang-out space with couches, chairs, lamps, and tables bearing his books and prints. As the only permanent gallery in the Wynwood Walls complex, The Peter Tunney Experience, artist Tunney has a unique position in Miami – and the art world. Tunney has had a wild ride to get to where he is, starting as a car salesman in Long Island he got pulled into Wall Street during a tech boom and made a fortune. After a few years of that he made a huge change. “I declared myself an artist in November 1987. I quit my job, cleared out my apartment and started a studio. I wouldn’t put anything back in until I had it going. Some artists wait to get inspired then go to work. The rest of us just go to work,” Tunney says. His first word artwork was painting the definition of courage from the dictionary. It sold and he knew he was on to something. From then on he concentrated on probing culture by mining images from newspapers, magazines, and art books then painting them into artful collage type work with layers and layers of images and paint. The former party boy – he once lived for 321 days in the back of a nightclub called Crobar as a dare/record breaking attempt in a VIP room with a jukebox and a bunk bed – now spreads messages of positivity. “DON’T PANIC”, “BELIEVE”, “GRATTITUDE” and “CHANGE THE WAY YOU SEE EVERYTHING” are some of his artwork messages. He also had a gallery in NYC in 1991 called The Time is Always Now, where he repped wildlife/fashion photographer Peter Beard as a main client. At a TED Talk he explained how he fills “the void” while wearing paint splattered pants. Tunney writes phrases on paper he pins to the walls of his studio that may or may not find their way into his artwork. As for his word and silkscreen artwork he says its “got a little Yves Klein, a little Duchamp, a little Warhol, because that’s who I’m made of.” There are also shades of Ed Ruscha, who has a permanent wonderful word themed art in the Miami Public Library downtown. His party days are long behind him. Today Tunney works on his collages as well as series of giant Polaroid portraits which were exhibited in the new gallery space at Wynwood Walls along with the camera itself. He describes his process with the 20 x 24 camera by taking the portrait then double exposing it with collage imagery that includes painting reproductions, newspaper photos or some of his previous work. He not only paints the models faces, he also paints on the initial image, scans it, then prints enlarged versions. His gallery is more of a hang-out space with couches, chairs, lamps, and tables bearing his books and prints. Painted surfboards hang from the ceiling. Thousands of people a day stream through the gallery’s strategic location behind the restaurant. The main wall on one side bears the Shepard Fairey mural that faces the street. Peter is often heard saying that he is, happily, “busy for the rest of [his] life,” living and making art between his two galleries and studios in New York and Miami. At a recent art fair Tunney was sitting at his booth making balloon animals just for the fun of it. For three decades artist Peter Tunney has crisscrossed the globe—from the African savannah to Wall Street boardrooms he has amassed a wealth of experiences: funny, harrowing, infused with tragedy and joy—and on the other side of these countless miles he has emerged an artist with a message. Peter Tunney brings energy to the art, and life to everything and everyone he encounters. 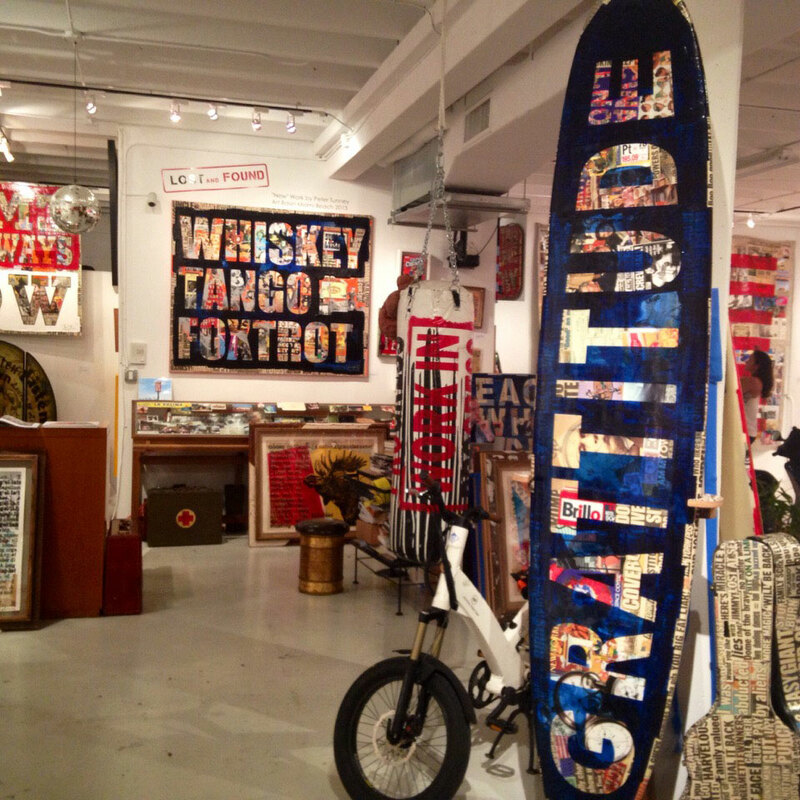 Peter Tunney Experience at Wynwood Walls is an obvious go-to.